There's really not a lot to add here. As heartbreaking as it has to be for the Royals to lose a seven game series with the tying run on third, there is no reason to hang their heads. They put on one hell of a show. They just ran up against possibly the greatest pitching performance ever put on through the month of October. No shame in that. If this series and this game isn't an "Instant Classic," I don't know what is. And, hey, maybe this coming year is the Cubs' year? Pop quiz! Can you tell me where the wheels came off for the Giants tonight? In all seriousness, I don't understand why Jake Peavy got the ball in this game. If you have so little trust that it had to be stressed so much that Peavy was on a very short leash, why run him out there at all? If you were going to yank him at the first sign of trouble, why bother with bringing the trouble on yourself in the first place? Just start Petit, and the whole game probably would have turned out differently. I have the same feeling about Tim Hudson tomorrow. If you don't trust him, why would you start him in game seven of the World Series? Just start Bumgarner and see how far he can bring you. They talk about maybe three innings out of him tomorrow. I'll bet he could give you at least six if you let him. He's got all summer to rest. But, clearly, Bruce Bochy isn't listening to me. Maybe he should start, though. I'm not so hard to get a hold of. Before we get into anything else here, let me add to the chorus of grief about the very shocking and extremely untimely passing of St. Louis' Oscar Taveras. Obviously it is tragic any time somebody loses their life in a car accident, and even moreso when those people are only in their early twenties. I don't mean to take the focus off the human toll here at all, because it is nothing but horrible. But to look at it solely through a baseball lens, Taveras has been a highly touted prospect for a while now and was just really getting his shot in the major leagues. He was right on that razor's edge of either making it or busting out. Now we will never know. That is a tragedy in itself. It is only more disheartening to know about all that potential that will remain unfulfilled thanks to the whims of fate. They say that momentum is the next day's starter. That has to be especially true when the next day's starter is Madison Bumgarner, who has to be the greatest pitcher on the planet at this moment. Truly, how big was last night's swing? The Royals were up 2-1 going into last night's game, and nobody had any real confidence in any Giant pitchers beyond Bumgarner, Petit, and maybe Lincecum. Then the Royals had their big inning, and you thought "Oh boy, here we go, this series is getting late early." Of course, that didn't happen. The Giants had a couple big innings of their own and pulled that one out, knowing they all but had tonight's game in their back pocket. And they were right. Let's be clear: the Royals did not play poorly. James Shields finally had a Big Game. Herrera pitched his usual shut down seventh. * Until the wheels came off a bit at the very end, Kansas City was only down two runs. But when Bumgarner is at his best, which he certainly was tonight and has been all month, two runs is insurance. Now the series shifts back to Missouri, where the Giants only have to pull out one more win, and could still conceivably do so with another Bumgarner start in game seven. *Then Ned Yost did Ned Yost things and left him out there in the eighth instead of handing Wade Davis the ball with a clean slate. It backfired, of course, but it also didn't really matter. The Royals aren't done yet, though. They get to go back home, where they will presumably hit a little better, both thanks to the more conventional set up of Kaufman Stadium and not facing Madison Bumgarner again. Or at least facing him on pretty short rest, which (they would hope) means he won't throw nine innings again. *Presumably Jake Peavy does not curse, because he quite clearly barked out "God bless it" when he got a little wild in game two. I thought Bruce Bochy made a pretty big mistake by not starting Madison Bumgarner tonight, both in terms of winning tonight's game an in setting him up to possibly pitch a game seven. I'm still not totally convinced that Bochy made the right call there, given how vital it was to win this game. * That said, Bochy might have saved this series for the Giants by rediscovering his best weapon out of the bullpen in Yusmeiro Petit. If he doesn't come in and give those three shut down innings, this series is likely over and those big innings never happen for San Francisco. *I'm trying to look at this ignoring the result. Sure, it worked out, but just because it worked this time doesn't necessarily mean it was right. Tomorrow, we'll get to see if "Big Game" James can (finally) live up to that name, and if anybody can solve Bumgarner this post-season. Bochy made a ballsy move in tonight's game. If tomorrow goes by the book, the Giants will be feeling awfully good about themselves going back to KC. To cut a long and not all that interesting story short, I had to watch this game recorded tonight. I'm glad I stuck it out, though, because that was everything baseball is supposed to be. Also, I didn't think I would say this during this decade, but I don't think the Giants have enough pitching to win this series. Unless they throw Madison Bumgarner* for three straight complete games, I don't know that the Giants can keep the Royals off the board enough. *My wife always had a bit of thing for Tim Lincecum in years past. Now that Bumgarner has grown a beard, though, it seems he's become her favorite. 1. A wise man once said that strikeouts are fascist and boring. Nobody told Greg Holland that, apparently. 2. The Royals have now exceeded the Rockies' miracle run. Good job! 3. They have also exceeded what the powerhouse Tigers did against many of these same Giants back in 2010. Good job! It's just one game, I know. You don't want to read too much into it. But, man, did this game not feel like "Rocktober" a few years ago? The similarities are staggering. Think back to that Rockies run of 2008 (if memory serves). They were left for dead midway through the season and then got unbelievably hot. They won a play in game in improbable fashion. They sweep their way through the first two rounds after that, and then are hit with a long layoff until the World Series. And when they got there? They went ice cold. Again, obviously, we don't know that this will continue for four games with the Royals. But it has to enter your mind, doesn't it? 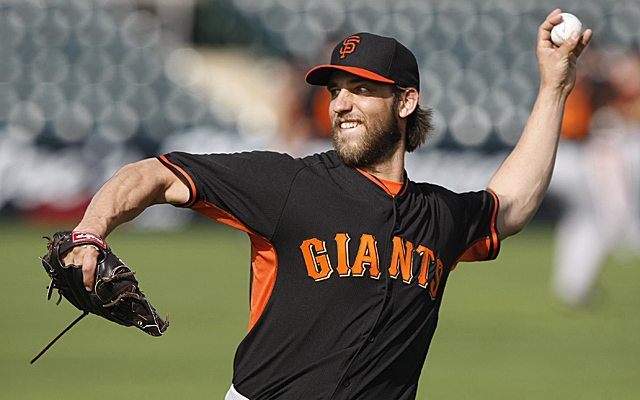 Then again, Madison Bumgarner is not going to pitch every single game. Even if I'm sure he would like to. Who would have guessed the Royals would be in the World Series again before the Cubs? Who would have guessed the Royals would be in the World Series before the Chiefs won another playoff game? What a crazy ride. To speak to scoring this game, I wouldn't have even given Hosmer one RBI, but TBS went out of their way to insist he was credited with one, so I have grudgingly went with it. Also, I didn't realize until after I scanned it I missed the attendance. That was 40,468, which is now on my hard copies. This is what the polar opposite of last night's game looks like.